4614 left in stock, Hurry! This acrylic gem display box is a practical way to store or display a single piece of jewelry. Each display features a slotted foam interior. 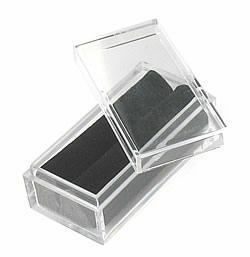 The foam is overlaid with a smooth black velvet fabric giving it a finished look.This acrylic jewelry display box measures 50mm (2”) in length and 25mm (1”) in width and approximately 19mm ( 3/4”) deep.